Similar in shape and size to the Denali, the Dhaulagiri is not the same ski. It is much more damp, playful, and forgiving. Built with a layup more similar to the Manaslu series, the orange screamers are fun and robust, at the expense of several extra ounces. The paulownia core has some poplar mixed in which adds a bit of rebound and strength. It also reduces vibration, as does the carbon-glass wrapping mixture. The Carbon Speed stringers that make the Dynafit skis stiff and light are still running the full length of the ski. That is except for the 3D flex tip, which is designed to eat up powder. The sidecut and shape has been tuned to be a little straighter and easier to slarve around. If you want to save a little cash and add a little smile, the Dhaulagiri is for you. Full sidewall makes the ski more damp and resistant to rock impacts. Paulownia-poplar core is strong and gives a lightweight poppy feel. Dual radius sidecut lets you control the turn with a weight shift. Carbon/glass torsion box wraps the core for rigidity and strength. Carbon Speed Stringers are used as a stiffening mechanism. Flex tip is cut to save weight and be forgiving in rough conditions. Pin tail eases pack insertion and planting the ski in the snow. Orange so you can find it and to double as a traffic cone. This is a great ski! I've been using it all season (6 local Skimo Races and the Whitefish Whiteout! ), plus several resort days, a few tours, side country and uphill dawn patrols. They are great in the steep and deep, floatation is excellent. Turn initiation is spot on and they are very forgiving. They do well blowing through crud and chop. My only complaint is they are not that great on boilerplate ice or super hard refrozen hardpack; you can get them to bite, but something with more camber would be better in those conditions. On the hard stuff, they also tend to chatter a bit at speed. Very happy with these skis! They seem to be a great balance between lightweight but not sacrificing too much in the skiability department. I am skiing on a pair of Dynafit Stokes, what would be a newer equivalent to that ski from Dynafit. I live in the Pacific Northwest if that helps with what kind of snow we ski on. Hey Steve! The Dhaulagiri would be a pretty close equivalent, but it'd do better as a complement rather than an equivalent. The direct equivalent in terms of weight, skiing style/performance, and whatnot would probably be something more along the lines of the Black Diamond Helio 105, but the Dhaulagiri would be an excellent complementary ski seeing as it's a touch narrower and offered in a lighter build. 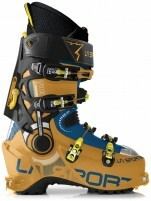 Depending on your boot selection, the Helio 105 would be an excellent ski in the PNW. I would love your recommendation on length for these skis, I'm 5'10", 176 lbs I'm moderate/advanced skier and do 70% Resort and 30% Touring. I was thinking that 183 should be my best choice, could you confirm? Hi Hector, yes the 183 would be a good length for skiing. Since you're mainly using it at the resort, that seems like a good bet. For backcountry-only, you could go shorter but shouldn't have a problem with the longer length. Just wondering what your recommendation for length on these skis would be. I'm 5'11", 145 lbs, and a moderate/advanced skier looking to tour exclusively on them. Torn between the 177 and 183 lengths right now. What are your thoughts? Hi Jess, I wouldn't go bigger than 177 at your size for touring. That is a really fun length. What is 8 + 2?